Contains Maps 11 and 12. Map 11 features the ancient underground city of Khax. Flyers have -1 Combat (B3=B2) when attacking or defending underground cities. Khax also gives Mountain Folk +1 Combat. The Knowstones henge is isolated on an island amidst the Quick Water. 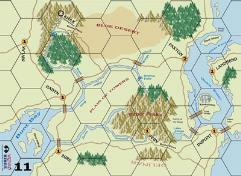 Map 12 is a vast plain divided by the Elwood Forest and Crimson Bog. These map join with the other geomorphic maps in Wizard Kings add more variety to your map layouts.